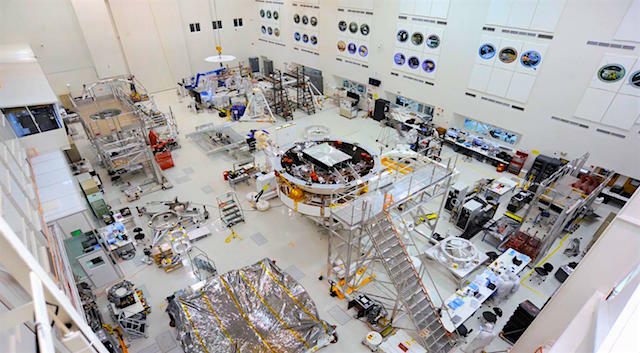 For the past few months, the clean room floor in High Bay 1 at NASA’s Jet Propulsion Laboratory in Pasadena, California, has been covered in parts, components and test equipment for the Mars 2020 spacecraft, scheduled for launch toward the Red Planet in July of 2020. 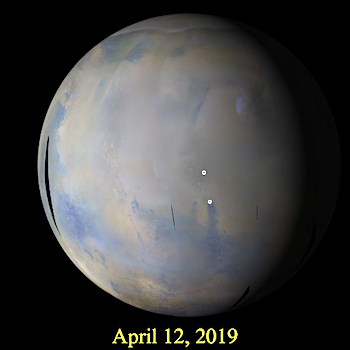 But over the past few weeks, some of these components – the spacecraft-rocket-laden landing system and even the stand-in for the rover (christened “surrogate-rover”) – have seemingly disappeared. In reality, they are still there, tucked neatly into the entry capsule, as they will be when it’s time for launch. The procedure is known as vehicle stacking and involves a hyper-detailed plan for what goes where and when. “One of our main jobs is to make sure the rover and all the hardware that is required to get the rover from here on Earth to the surface of Mars fits inside the payload fairing of an Atlas V rocket, which gives us about 15 feet [5 meters] of width to work with,” said David Gruel, assembly, test and launch operations (ATLO) manager for Mars 2020 at JPL. Sometimes Mars’ surface is just beautiful as seen through the eyes of HiRISE. This is one example on the floor of Ius Chasma, part of Valles Marineris. The region has had a complex history of sediment deposition, deformation, erosion, and alteration. THEMIS Image of the Day, April 18, 2019. The polar caps of Mars were deposited over millions of years. Seasonal depositions of ice and dust have created layer upon layer of material. 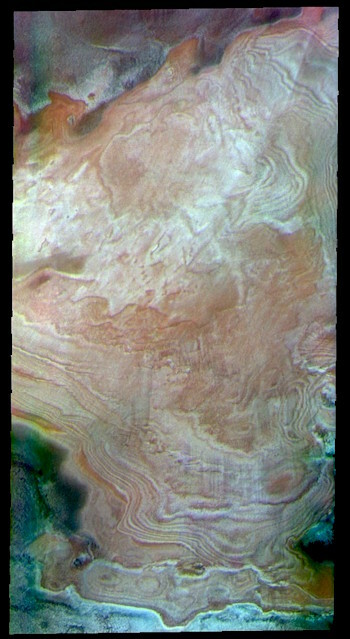 In this false color image the white and orange layered features are the polar cap. The greenish and purplish regions are ice free surfaces. Explore more THEMIS Images of the Day by geological subject. Sol 2380, April 16, 2019, update by MSL scientist Brittney Cooper: Yesterday’s discussions with the science team focused on determining which target in the vicinity of “Aberlady” will become the focus of the next drill campaign: target 2, or target 3 (pictured in the Sol 2379 Mission Update). In the end, target 3 was recommended by rover planners for its flatter texture, as an APXS raster of both targets showed there wasn’t a large difference in composition between the two. Once formally included in plan activities, target 3 will be given a proper name consistent with those being used in the “Glen Torridon” region. Cerberus Fossae is a steep-sided set of troughs cutting volcanic plains to the east of Elysium Mons. Steep slopes on Mars have active landslides (also called “mass wasting”), and here we see evidence for two types of activity. THEMIS Image of the Day, April 17, 2019. 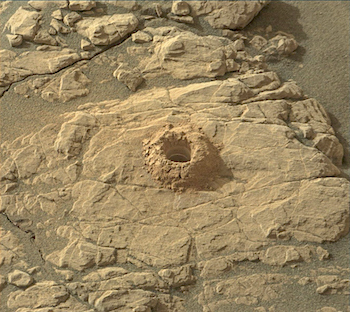 This VIS image shows part of the floor of Pollack Crater. First imaged by Mariner 9, the high contrast between the crater floor and the bright feature, led to the informal name “white rock” for the bright floor feature. More recent images have shown that the floor of Pollack Crater is darker then normal in that part of the crater, which has produced the high contrast. THEMIS infrared images of the feature indicate a composition produced by wind deposition, rather than water. Additionally, the deposit does not appear to be solid rock. 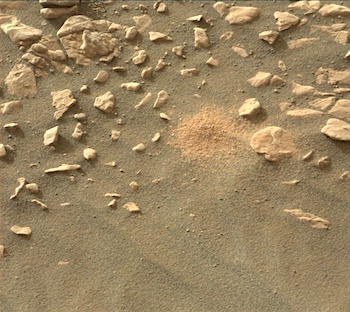 The deposit is most likely a combination of dust and a more solid material. Taken together, the Mariner 9 image of white rock didn’t hold up under careful study, it’s not white and it’s not rock! Sol 2379 raw images (from all cameras). Sol 2378, April 15, 2019. 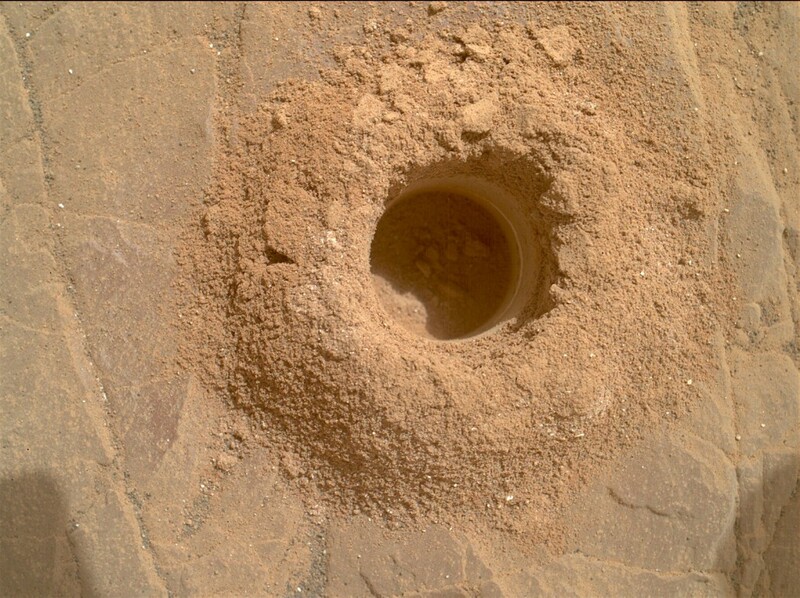 The rover’s Mars Hand-Lens Imager (MAHLI) peered into the Aberlady drill hole and saw tailings inside and out. In addition, it recorded the light-toned layer partway down the hole. Its composition — gypsum? — and origin remain so far undetermined. Some of the white flecks among the tailings and on the rock surface are likely bits of this layer. Click the image to enlarge it. Sol 2378 raw images (from all cameras).